Design experts at Eadon Consulting are working on a project to replace a key bridge in the beautiful North Atlantic Ocean territory of Bermuda. A rapidly expanding engineering design consultancy, Eadon Consulting, works across a number of sectors, with expertise in mechanical, control, hydraulic and structural design and has moved office four times in six years within the AMP Technology Centre on the Advanced Manufacturing Park (AMP) in Rotherham due to the growing nature of the business. In December 2017, Ramboll, the lead consultant, along with Knight Architects and Eadon Consulting, won the contract to deliver full design services for two ageing crossings that have connected L. F. Wade International Airport with capital city, Hamilton to the west, and the town of St. Georges to the east, for over 50 years. Eadon Consulting's role is as the lead mechanical, electrical and hydraulic designers. Starting from a blank sheet of paper the team has worked through a feasibility options study considering both fixed and moving bridges for the two locations. Swing Bridge, which currently joins St George's Harbour with the west of the island is a critical link for both motor vehicles and marine traffic, and will be replaced by a bascule bridge (sometimes referred to as a drawbridge) with a distinctive curved soffit, providing a 22 metre clear channel for shipping access to St George's harbour. A spokesperson for Eadon Consulting, said: "The selected solution with its distinct shape and colours captures the soul of the island. After a public consultation on the 26th of September, the design has been approved and we are looking forward to moving the project through to the final detailed design and on to site. 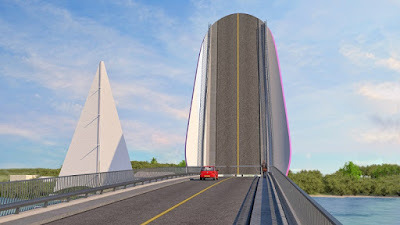 "The stunning bascule bridge is an elongated shell structure made of steel. The bridge will rotate around two horizontal pivot bearings, located within the deck cross section. The deck is being lifted by a pair of hydraulic cylinders, located between the bearings on a bespoke pier." Eadon's bespoke design solution has enabled the architectural impact of the concept to be maintained. The bridge has a curvaceous and flowing appearance, defined by a small number of continuous edge curves. It will be finished in a pale grey, with soft tones of orange or pink to accentuate the forms. The mix of white and pastel colours references the distinctive palette typical of buildings throughout Bermuda. As well as an aesthetically pleasing appearance, the curved design minimises the collection of water on the bridges, an important factor in resisting the corrosive effects of the tropical maritime climate. Other bridges that have been supported by Eadon's team include the Lower Hatea bridge in New Zealand, the Copenhagen Swing Bridge and the Greenwich Reach Swing Bridge and Merchant Square Bridge in London.